With a HUGE series of booming fireworks, Ho Chi Minh City and the People's Republic of Việt Nam welcomed the Chinese New Year at midnight last night. For over a week now, the local parks have been filled with vendors selling massive potted chrysanthemum plants, orchids, and an incredible selection of trinkets and gift items for family members and friends. This is a time for renewal. 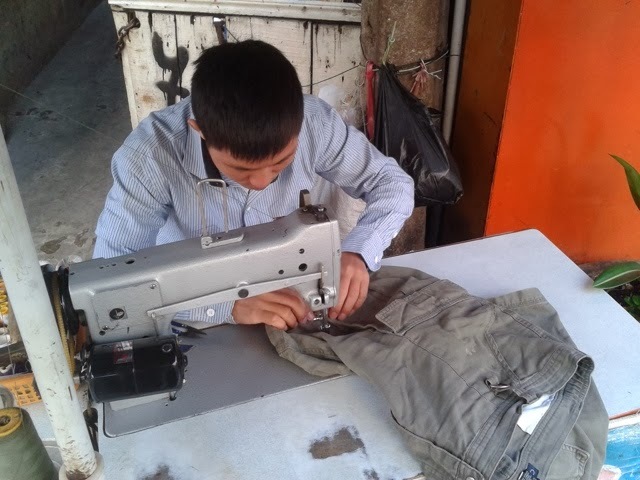 New clothes are purchased, huge meals prepared, and the sidewalk in front of each business and home is thoroughly scrubbed clean to help facilitate a new beginning. HCMC is virtually closed, because this is a time traditionally spent with family. Since most people here are from somewhere else, they travel to their family home village or city with gifts for their family. Most stores and restaurants were shuttered yesterday for the holiday and will re-open in five days, maybe a week. Here in the tourist-heavy area of District 1, there are a few restaurants still operating and the hotels are open, but well over half are shuttered. For this Westerner, it's a big strange to be wishing people a Happy New Year for the second time in a month, though it feels good to see everyone so happy. Thank you to my Seattle friend Huong for suggesting I extend my trip a few days to experience this. It is wonderful! It's January 29th, New Year's Eve Eve, and with many people heading out to their home villages, the city is significantly quieter than when I left four days ago. I met Thinh and her cousin Ngôc for a late drink at the GO2 bar just down the street from her family's eyeglass shop. As she and I were talking, Ngôc, whom I'd just met, reached over and stroked the hair on my arm. Since a couple other Vietnamese women I didn't know had done the same thing over the past two months, I knew what was coming and beat her to the punch line, saying, "Samesame, monkey." As you can see, compared to Thinh's arm, mine does look a bit simian. 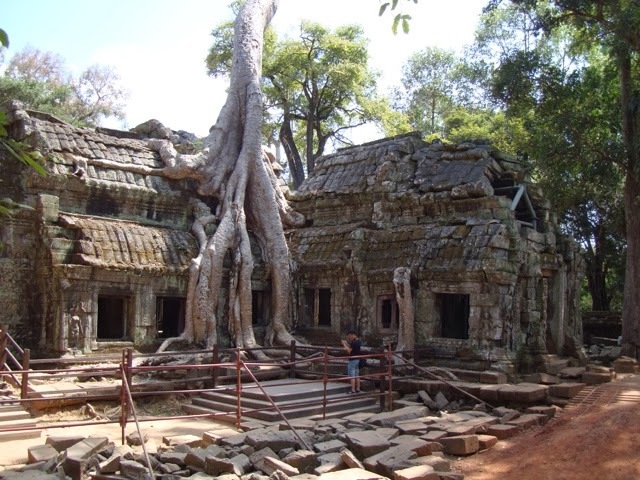 A few months ago, while researching places to stay in Cambodia, I ran across some information on a place called Soria Moria. In addition to the 51% employee ownership, the property makes a lot of donations to, works with, and sells hand-made products for, a number of charities. 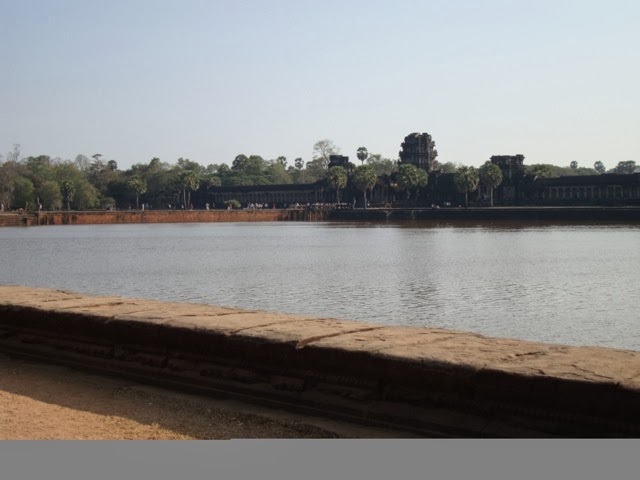 I immediately decided to stay there while in Siem Reap. During my check-in at the Soria Moria, I asked about the possibility of renting a motorbike. This adventure was originally designed as a motorcycle adventure and I felt the need to ride in Cambodia for at least a little while. 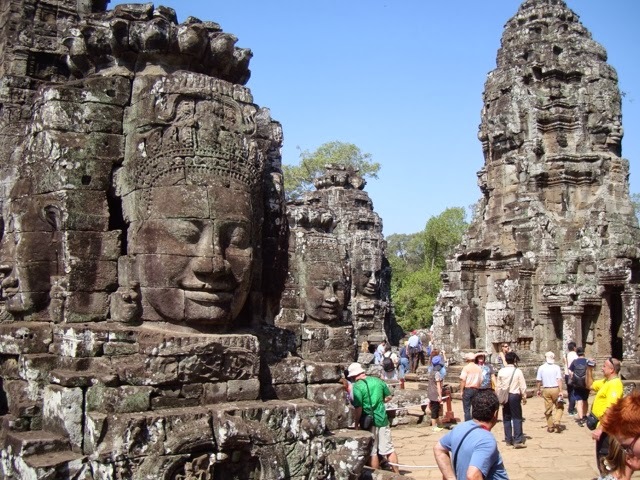 I was given a brochure for Khmer Ways Moto Adventures that, in addition to full-day and customized tours, offers a guided half-day tour of "beautiful spots, back roads and tracks through villages, picturesque scenery, and... an impression of the daily life of the inhabitants surrounding Siem Reap." Sign me up! If the publicity didn't hurt tourism (people hear that tourists died, and they tune out the part about they were way out of their depth), I'd be all for letting them rent motorbikes. As my friend Gus taught me almost 40 years ago, things like this help purify the gene pool. Back to Veach and the motorbike. Because I read the words in the brochure and didn't look at the photos, I thought that we'd be riding a real motorcycle. Nope. It was my first time on a semi-automatic bike, though, so I took it for a short ride to see if it had any huevos (nope) and to try a few clutch-less shifts. No problem, let's roll! We took a right onto a dirt road that, after 100 meters or so, had a thick layer of silt or sand or powder or something. Let's call it powder that rides like sand. We spent much of the next hour riding through and past village after village, slipping and sliding. 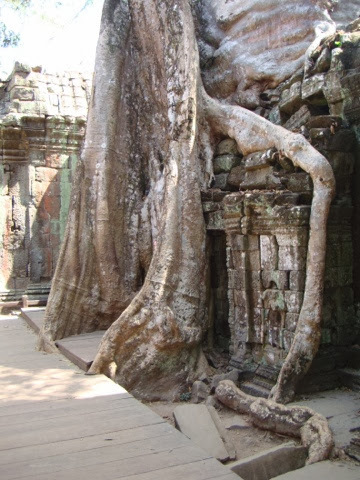 Again, if I'd read between the lines in the brochure, "...back roads and tracks..." in Việt Nam means no pavement, so it probably means the same in Cambodia. Although I was tired and the fun factor was creeping into the negative, I stuck with it. Veach saw that I was unhappy and apologized. It wasn't his fault, though I did tell him that I wanted to get back to pavement as soon as possible. After a short break for a beverage, we rode another five minutes (back on pavement) to the bottom of a steep hill, dismounted, and started climbing toward the temple. 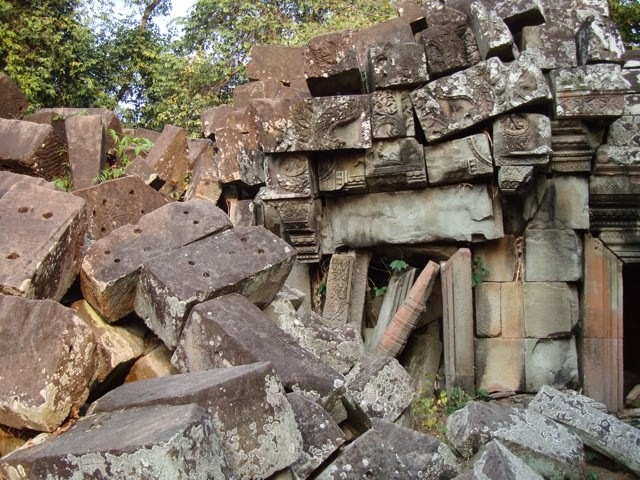 Called Chou Sripy Vebol, these ruins are among the oldest in the area. Veach did a good job of explaining things. 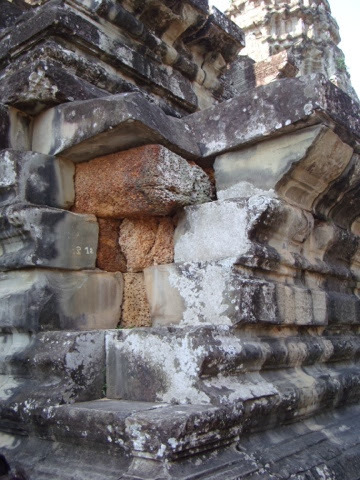 A bit of this temple has been braced to help arrest further deterioration, but no real reconstruction is visible. On the way back to town after the temple visit, I finally convinced Veach that he could pick up the pace I and could and would keep up. The ride back was much more fun at speed! Upon my return to the Soria Moria, I tried to transfer photos to my SD card so that I can put them on my iPad. Unfortunately, either on this computer or the previous one I used, there is some nasty crap. I ended up with over 1000 spiders on one memory chip that had to be professionally cleaned up. To be safe,the next day I took a few of my memory chips into the computer shop next door and Rithy, the owner, took some time right near closing to ensure all were scrubbed. Cathy Net Computers Technology; Watbo Street next to the Soria Moria Hotel. The next day I was unable to access some of the files on one of the memory sticks, so I took EVERYTHING back to the shop. Rithy was not there, but his very capable Number 2, Reasey, spend quite a bit of time re-cleaning each memory stick and card so that I am now completely virus- and spider-free and didn't lose a single image. Thank you to Rithy and Reasey! Since I'm on the subject of bugs and the chronology is a bit out of sync, this is a good time to bring up another bug. A spider, technically an arachnid, is for purposes of the next paragraph, a bug. While walking through the food market at the edge of the Siem Reap Night Market, I found a guy selling BIG fried spiders that had hairy legs and looked a lot like tarantulas. Since I'd never tried one before, I had to give it a shot. It most definitely did NOT taste like chicken! It was a bit chewy and the hair tickled my tongue and the inside of my mouth. This experience will mostly likely go into the one-time experience category. Earlier that afternoon, as we finished day three of temple visiting, we passed a sign outside the Kantha Bopha Children's Hospital that urgently asked for blood donations to help with the blood shortage caused by hemorrhagic dengue fever. As soon as I dropped my stuff off at the hotel I asked Mr. Rithy to take me back to the hospital so I could donate blood. It all went quickly and well... Up until the part when I was sitting up in a chair so they could take my photo for their donor wall and I felt something running down my arm. Then, while they were cleaning me up, I looked down at my pant leg. I walked out of there looking like I'd taken a hit of shrapnel. All in a day's adventure! On my departure day I ate a leisurely breakfast (included in the rate) and then packed for my flight home to Ho Chi Minh City. Mr. Rith would pick me up for the airport at 2, so I had time to check out the "fresh Vegetarian food" restaurant called "peace café". A block from my hotel, the mostly outside-seating establishment is set in a beautiful, mature garden with assorted tables and chairs set up in small nooks formed by the plants. I ordered a glass of fresh carrot juice with ginger and a vegetable panini sandwich. Unfortunately, before I got the juice my appetite was ruined my a massive cloud of cigarette smoke from one of the patrons. After five minutes of trying to breathe around the noxious gasses, I gave up and moved as far upwind and away from her as I could. Then, before my food came two 20-something American girls (could tell by the accents and inappropriate use of the word 'like' four times per sentence) sat down two tables away and immediately lit up. WTF are people doing SMOKING IN A VEGETARIAN RESTAURANT??? Since I had nowhere else to go that was out of the clouds and stil in the restaurant, i told my waiter that I needed my food for "take away." While I waited, I asked why people were allowed to smoke there when the goal of such a place is improving health through healthy eating? He didn't have an answer. The food was okay, but the cigarettes ruin the ambiance. I will not return to this restaurant. Have you ever been SMACKED in the eye by a wild monkey? That's most likely because you've never tried to recover a banana it stole from a smaller monkey. I ask because I did both today... the attempted recovery and the "SMACKED" parts, not the stealing part. Earlier we had stopped and bought a medium-sized bunch of bananas from a roadside vendor so that I could eat them in the 24 hours before I return to HCMC. As we headed back to town from the final temple tour of the three-day visit (temple coverage is coming), we saw a large troop of monkeys spread out along both side of the road. As I toss a couple bananas out to a mom and baby, the others quickly gathered around. I guess I was tossing them out a little too slowly to satisfy some, so they climbed/jumped up behind and to the side of me to, I guess, convince me to give THEM the fruit. Which I did. 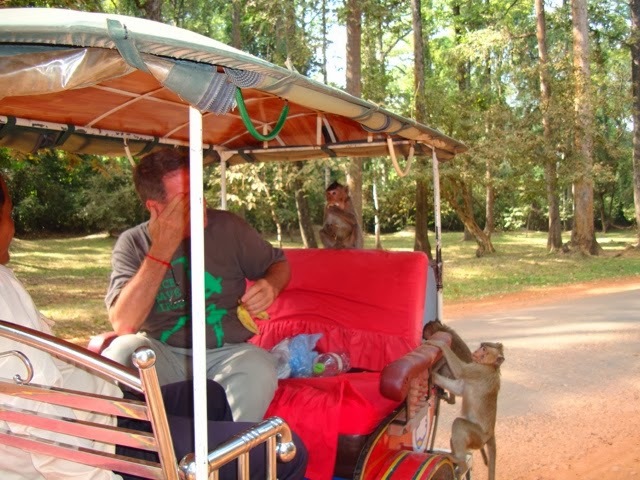 You can see how scared monkey1 was of me... that's her sitting on the top of the seat eating her second banana. I was very fortunate and dodged yet another bullet. THAT call to Global Rescue would be an interesting one... "You did WHAT???" Yes, I really did say, "No!" out loud. Note: I intentionally referred to monkey1 with both male and female pronouns because in all the excitement I neglected to determine which applies. 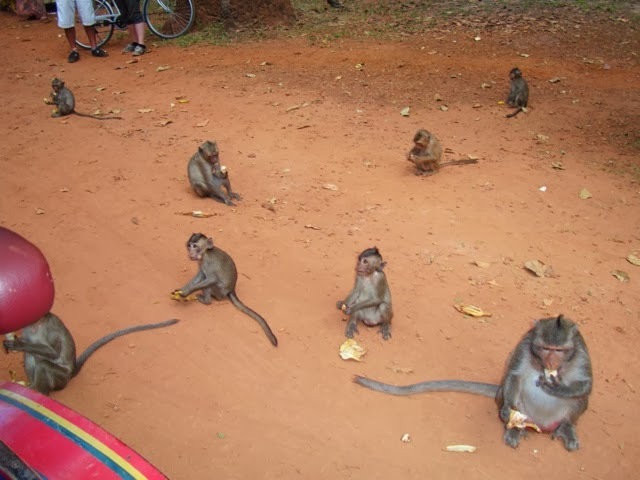 Note: Monkeys neither understand nor care that you've run out of bananas. They want more and will start looking for other things of interest if you don't have them. 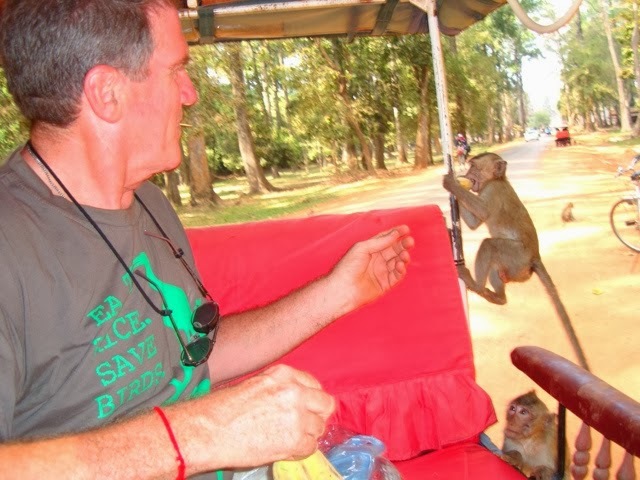 If you are going to stop and feed the monkeys, make sure there is nothing lying loose (camera, guide book, small bag of souvenirs, hat...) that they can grab. 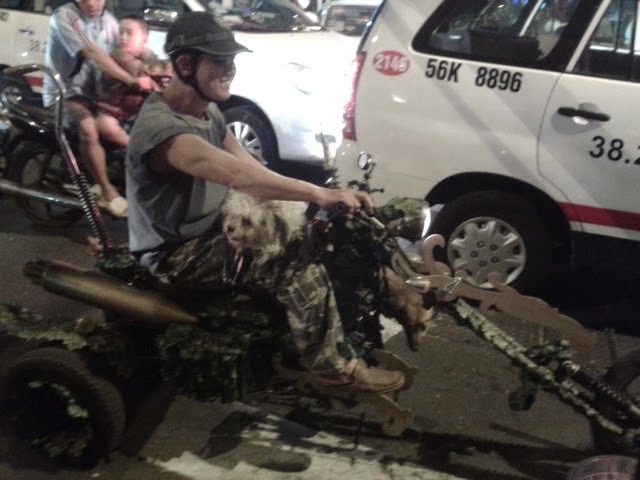 Thanks to Tony for warning me of this as they climbed on the tuk-tuk. 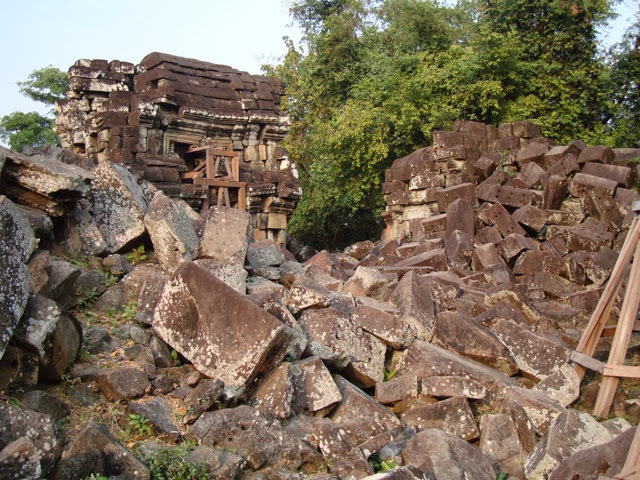 That's what the first Westerners found when they "discovered" the temples of Angkor... the world's largest three-dimensional jigsaw puzzle... almost completely hidden from sight by almost 1000 years of forest growth. 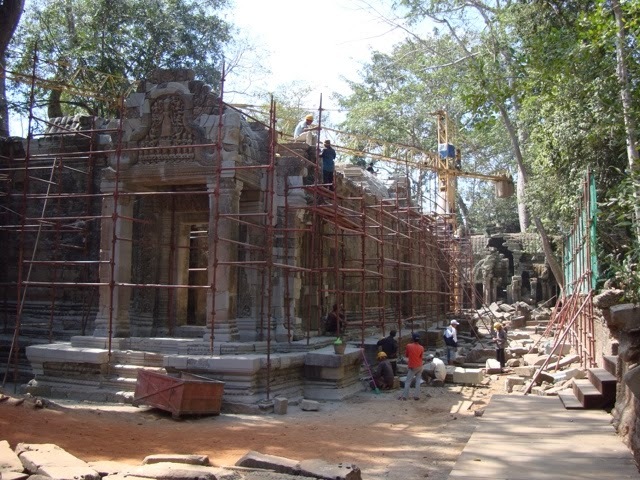 Today, over 150 years later, the forest has been cut back to a perimeter outside the walls and many of the temples' main structures are partially of almost completely rebuilt. The task is daunting and is greatly helped with money from China, Korea, France, Germany, and the U.S. 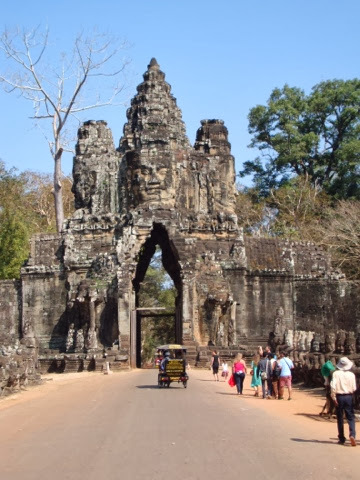 Taking an 8:20 a.m. Vietnam Airlines flight put me through Cambodian Immigration and Customs before 10 a.m. and Mr. Rith, my tuk-tuk driver for the duration, was waiting for me and holding a sheet of paper with my name on it. I'd forgotten how nice it is to be met at the airport, even if it is by a total stranger sent by the hotel. Mr. Rith dropped me off at the hotel and we agreed that in about 30 minutes he would take me to the Angkor National Museum. The welcome given by the reception staff at the Soria Moria Boutique Hotel could hardly have been warmer. I immediately felt like this was a great choice for me. The hotel is 51% employee-owned and everyone I encountered in my three-day stay was smiling, friendly, extremely helpful, and apparently glad to have me there--just like any owner. The rooms are large and comfortable, there is a rooftop bar and sun deck, a "sky jacuzzi", a spa, and free Wi-Fi for guests. On Tuesday, they will even offer to help me get the blood out of my pant leg! 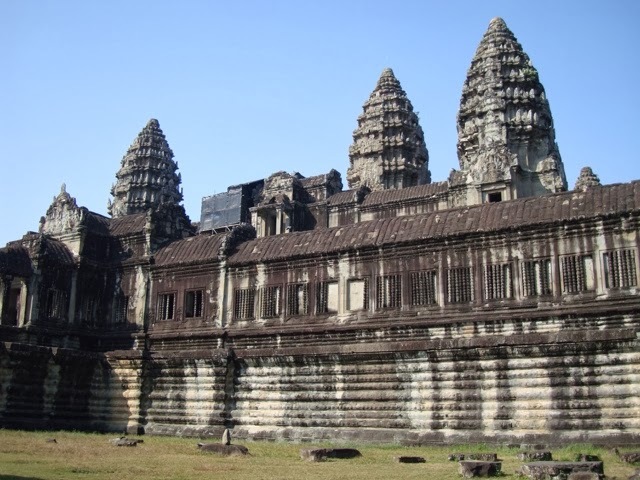 When you go to Angkor, please go to the Angkor National Museum BEFORE you go to the temples, unless you are either Hindu or a religious scholar. Most of us in the Western world, myself included, are painfully unaware of other cultures and religions. 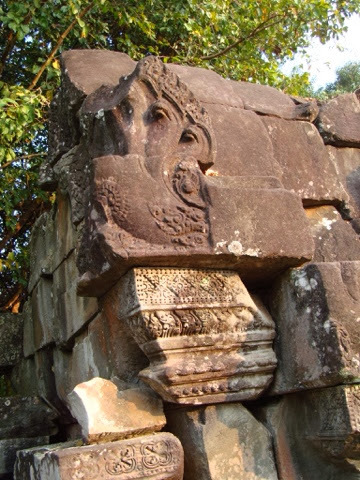 When your Guide talks about a lingua or Shiva or Garuda or Naga, you will have a much better chance of understanding the context and remembering who or what something is or means at the next temple IF you have already taken 2-3 hours to tour the museum. 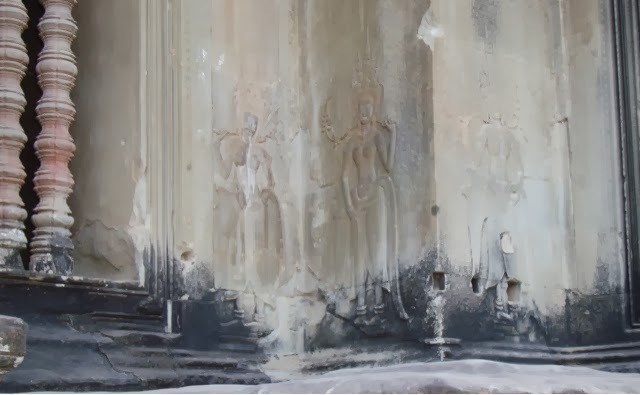 You will also see the 1000 Buddhas that used to be in one of the temples. Click here for a quick reference guide to a few of the key figures. 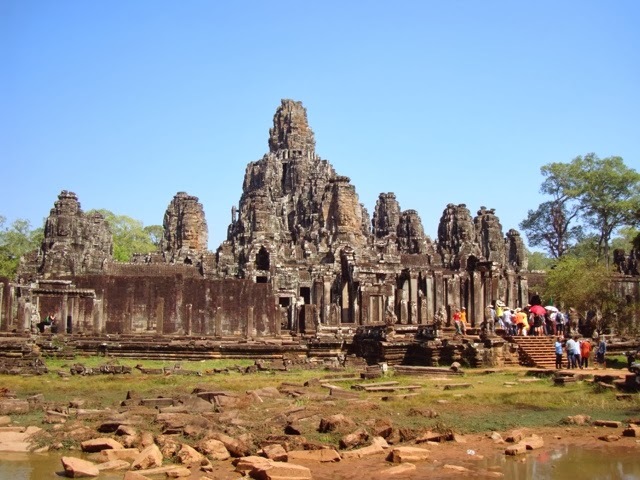 a) The temples are MUCH bigger than they look in the photos unless you have a frame of reference, e.g. a person in the shot. b) Virtually every surface is intricately and exquisitely carved with almost unbelievable attention to detail. c) They were created with hammers, chisels, sticks, rope, muscle, and a great vision. 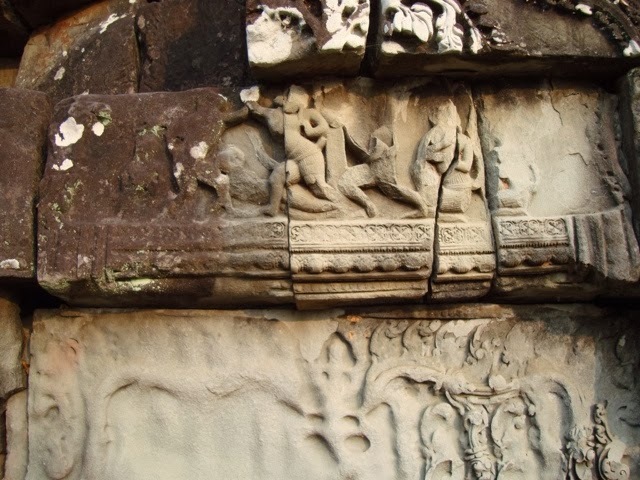 d) The temples are sandstone built over a limestone base. The quarries for each are ~60 km away. 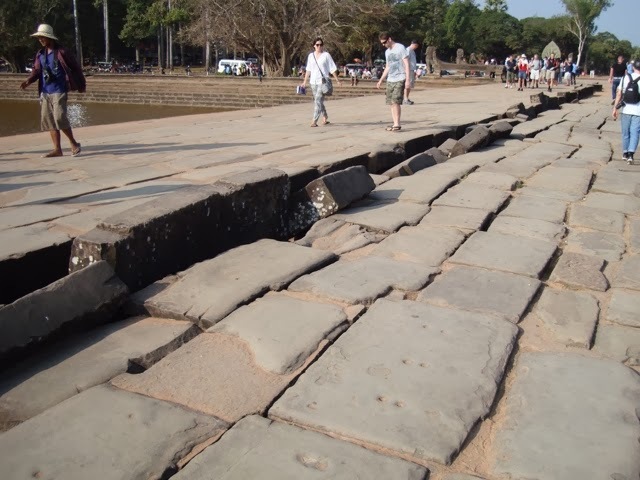 ~100 foot-wide hand-dug moat surrounding and protecting Angkor Wat; causeway at left. The right side is unrestored. The edge of a window and Aspara dancers, each on a different plane. 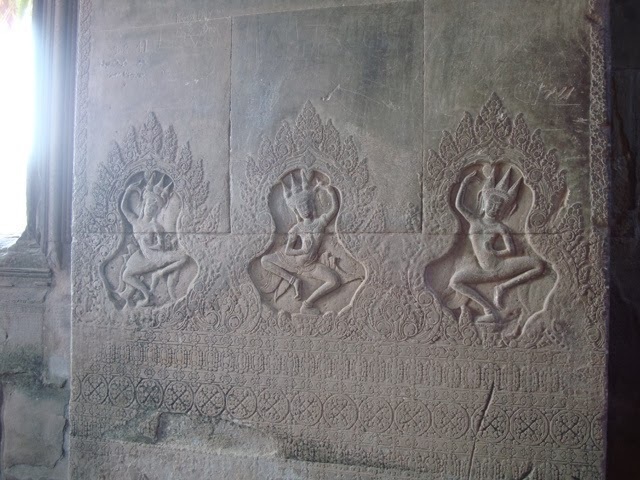 Aspara dancers, each ~18 inches high. 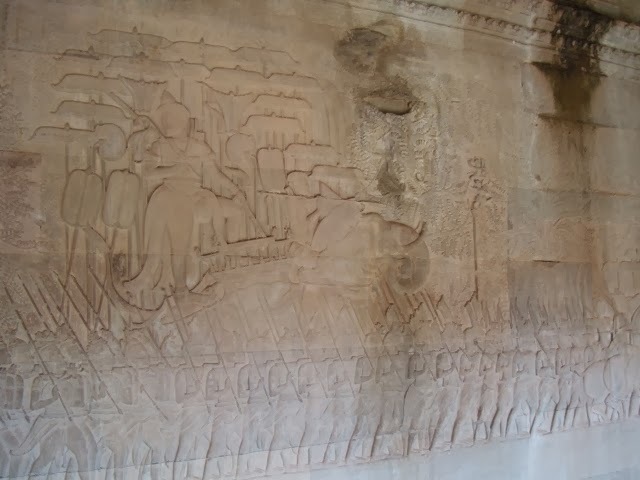 King Suryavarman II on his elephant (notice the matching royal headgear) with his troops. 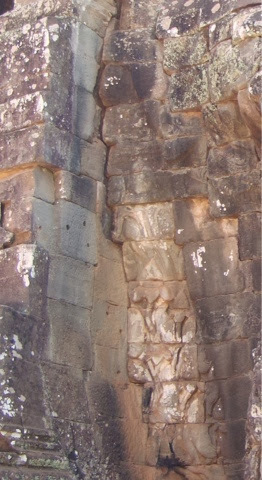 Portion of carving shown ~60 inches high. Angkor Wat East side of South wall. 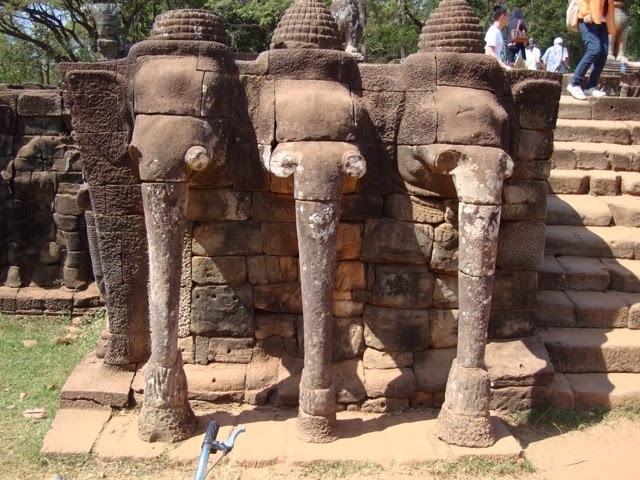 Notice that the towers are all lotus-shaped. 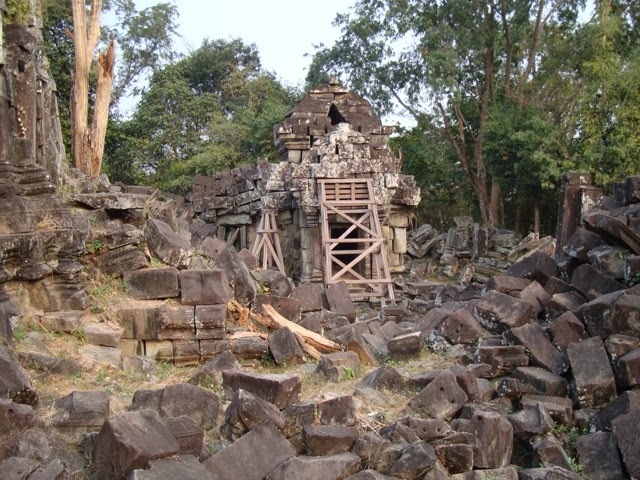 Entrance gate to Banyon Temple. Note the face. 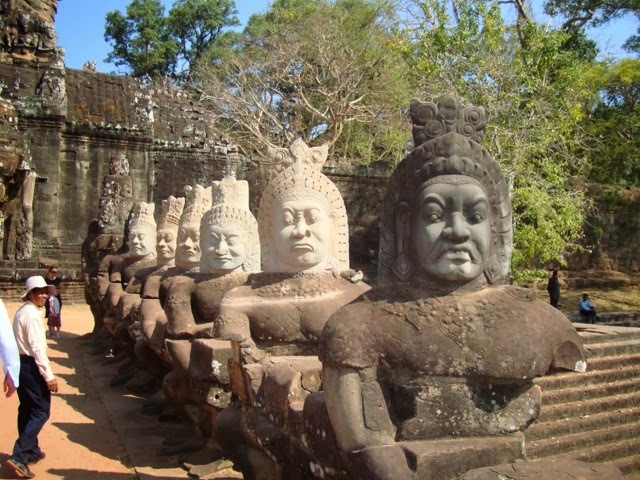 Guardians at Banyon Temple. Dark are original; white are restored. 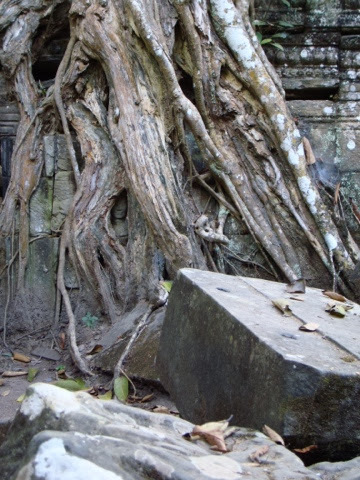 This is how one distinguishs old from restored at all temples. I like this shot from the beginning of the post, so you get to see it again. 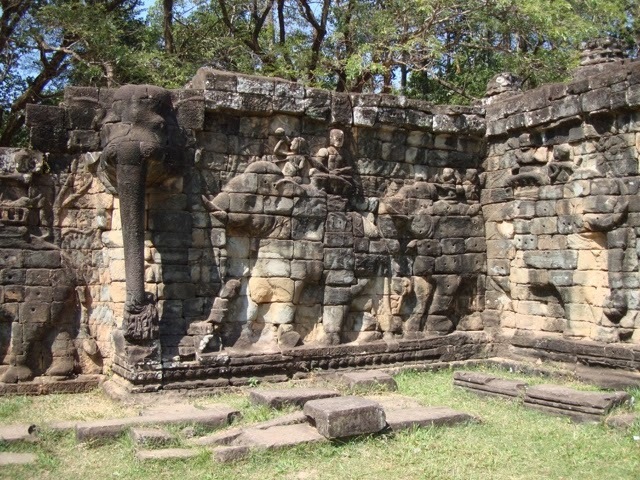 The Elephant Wall is 300+ yards long and all carved in this style. 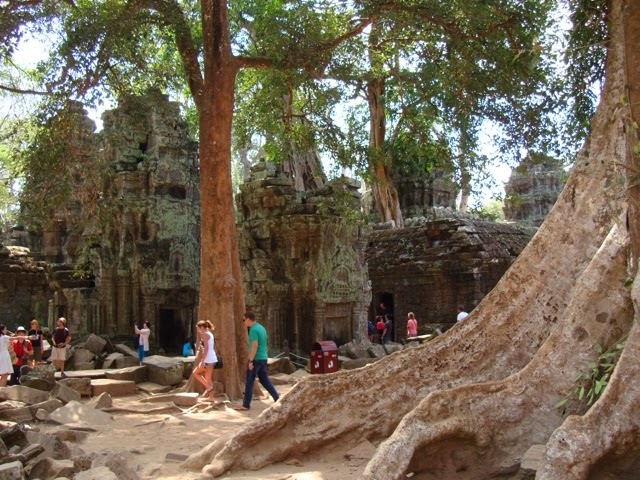 Many of the trees that engulfed Ta Phrom were left intact to show how nature had taken it back over the centuries. Story: The richest 85 people in the world have as much wealth as the poorest half... of the entire world! When is Obama going to sign an Executive Order freeing Edward Snowdon from the possibility of prosecution persecution? I brought three pair do glasses with me because I figured that traveling extensively would take its toll. So far, I overpacked. It took 8 weeks to render the first pair pretty much unusable. The frame broke, and the lenses (one prescription ago) are still okay. Terrance told me about a shop a few blocks away that'd helped him out in a similar situation, so I wandered down there this morning... and in 30 minutes they put my old lenses in a new frame for a bit under $30. If they were my #1 or #2 pair, I would've gone for the $60. frame, but these will be just fine. Everyone I dealt with was very helpful and there is an optometrist on-site. This tiny shop just opened this week and is run by a very nice young couple. Since the fruit is fruit until you ask them to make it into juice or a smoothy, you can't find any fresher juices anywhere. With four HCMC locations, one will probably be near where you're staying. Very fresh and flavorful, this corner location means it's always busy. You may get to share a table with a stranger, so pull up a stool, order a hot bowl of this ubiquitous noodle soup, and dig in. Conversation optional, though most natives I've met talk before and after, but rarely during the meal... Unless they're quite well off. Note: Slurping your noodles is both necessary and standard phớ-eating etiquette. The owner is almost always on-site and both she and many of her very capable staff speak good English. Very clean rooms at fair and reasonable rates AND, if you've rented or purchased a motorcycle or scooter, there is 24-hour indoor, secure parking. If you want a western-style shower, let them know when you make your reservation. Tell them I sent you (show the picture from the blog) and she may come down a dollar or two on the rate. Across the street from the Havy, is another good hotel. Owner Kim and the reception staff also speak good English, the rooms a bit smaller, and rates are comparable to the Havy. If you do not need parking, this is an equally good choice. Note: I was able to walk into both hotels and secure a room for that night and beyond. There may be times that a reservation is needed. Both hotels are in the US$20/night range. As I wrote about a month or so ago, I screwed up and updated the software on the iPhone3GS--which then would not finish rebooting--rendering it useless. Until today, when I finally decided to spend some time seeing if any of the shops calling themselves "Apple Specialists" could figure out WTF was wrong with it. The first shop spent 20 minutes or so working on it, with the bottom line that they "don't have the equipment to fix it because it's too old." No fix, no charge. Next, I wandered down the street to another shop a kilometer or so away. Their Specialist handed it back to me about 30 minutes later and the only thing I needed to do to use it was ask him to switch the language from Vietnamese to English. Total cost: 100,000VND (less than US$5), plus the 40,000 VND tip I gladly gave him. It's working just fine, now, thank you! 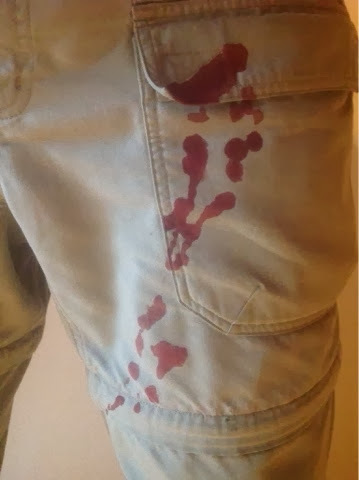 My favorite shorts had a ripped seam for a few years and I was frequently less than careful about putting things in the right front pocket. The rip's gotten larger since I've been here and when this street-side repair "shop" appeared last week, I decided to give him some business. He was working on some jeans and I want, but he stopped working on them put them aside any song. I handed in my shorts, showed him the lack of scene, and he went to work. After choosing almost exactly the right shade of green for the thread, he wound a bobbin, loaded the thread, and two minutes later had the seam completely repaired. When he asked for 10,000 VND I shoot my head 'No,' and handed him 30,000 (US$1.50). He smiled broadly, thanked me, and I went happily on my way. I first met Trang (pron. Tran) when she was one of a two-manicurist team who did a very good job on my left hand. When I returned the next day for a massage, she remembered me and asked if she could be my masseuse. Absolutely. The one-hour massage was extended a bit at my request and was one of the best I've had in-country. She was very good and extremely professional. The massage was 200,000 VND and I tipped her 300,000 VND to make it an even 500,000. Money well spent, because two days later I'm still feeling good. Another choice is Khả Hấn, 40 Nguyền Cư Trinh, a couple doors to the left of the shop above. I went there when I first arrived and had a borderline negative experience, but when Như Sương closed for the Tèt holiday, I thought I would give it another go for or a neck and shoulder massage. Fortunately, I drew a very nice and professional young lady named Thu (pronounced "to"). She did a great job and, although her English is limited, she was able to understand what I wanted. As a woman who depends on tips to live, she chooses to up-sell with a manicure instead of the additional private massage options often offered by others. I said yes, and my fingernails look as good as they ever have. She also offered a pedicure, but I was running late for another engagement, so I returned the next day. See my post "Tạm biệt (goodbye) Việt Nam... for now" for a photo from that session. See Sài Gòn, Random Thoughts, Phần Ba dated 21 January for a few more restaurant suggestions. 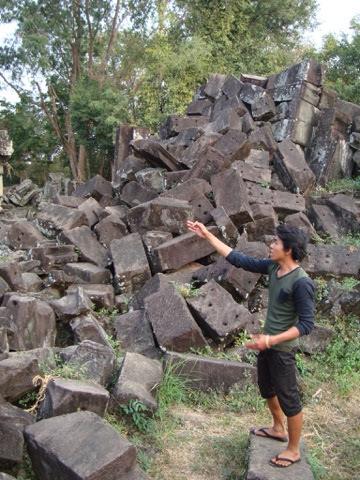 As interesting as it would be to be there observing, my decision to stay in Viêt Nam may mark the return of my common sense. Best wishes to the protestors. May you get the government you want. A couple days after I got back to HCMC, one of my new friends wanted to go to the Ben Thanh market for dinner. Really? This indoor market reminds me of the Preston Henn Swapshop in Fort Lauderdale and any of the bazillions of cavernous buildings across the world with 1,000 individual very small businesses each in its own tiny cubicle. They're actually rectangles, so would they be recticles? Neither time I've been there have I seen anything I would categorize as 'food'. I was very surprised when we arrived and sat down at a number of restaurants that materialize each night, at least one of which is almost a block long. 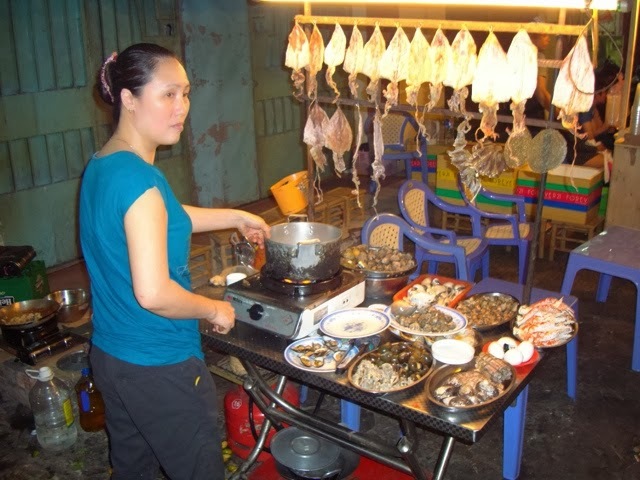 The one we visited features GREAT fresh seafood prepared just about any way you'd want it--and at Viêt Nam prices. One of the items on my very short list of things to do before departure is to enjoy another dinner there. 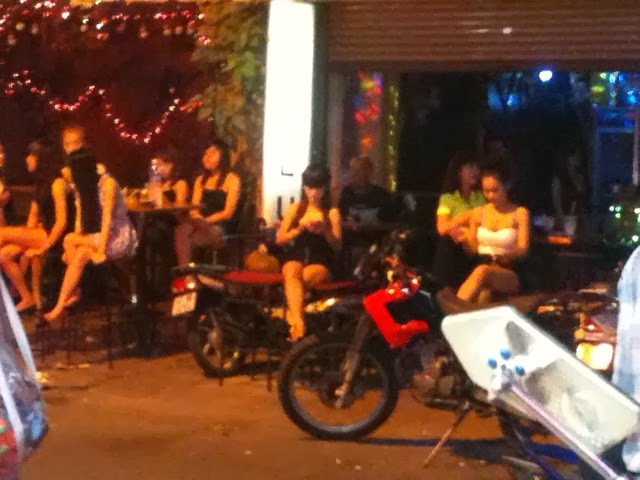 "Hello Girls" is my new term for the dozens of bar girls (there are also boys and lady-boys at at least two places I've passed) in the tourist areas. It sounds more forgiving than "Bar Girls", at least to me. These very attractive, though understandably a bit hard-looking, women sit at tables flanking the streets and call out "Hello!" to virtually every male who walks by without a female companion. The greeting may also be accompanied by, "Come sit/talk with me." or "I'm bored..." They are at times insistent, though always polite. Although I have yet to succumb to their siren call, I have a few ex-pat acquaintances who have. They tell me that the girls are mostly uneducated, from poor families in small villages, and find this the best or only way to earn a living. Unfortunately, they work on straight commission--a percentage of their customers' bar tab, including the high-priced sugar water the girl drinks--and, if they choose, whatever they can make by getting invited to a customer's room for an hour or all night. I say unfortunately, because most nights the great majority of the Hello Girls I see are without customers. It's a lousy way to make a living... I may even stop in one night, limit my spending to a couple glasses of sugar water, and thereby contribute a little more to the very local economy. It occurred to me that of the 15 to 20 people I've met who have made or are making HCMC to Hà Nôi or Hà Nôi to HCMC journey by motorcycle, the oldest one is 31 years old. So yes, especially when considering that I've completed 60 laps around the sun, making it to Hà Nôi was one hell of a accomplishment! During a conversation with Mimi from Cần Thở, I mentioned that one of my ex-pat acquaintances is continuously telling anyone who will listen about the many, many women he beds--ocassionally with no up-front money. Mimi said, "He's a butterfly". He is now known as Butterfly, though we haven't told him. Yet. There are a couple places I've been shown in the area that serve excellent snails, clams, and crab, and I've returned to them both. The first is a no-name street kitchen that manifests every night in the front of a parking garage between 149 and 155A Bùi Viên Street. It's run by a couple and their daughter and they display the evening's fresh selection street-side. The place is full all night, every night, and the three of them barely slow down until well after most of us are asleep. The second is Ốc Đào, a regular restaurant at 132 Nguyễn Thái Học Street. I recommend the upstairs seating area. One place I suggest you avoid is Saigon Kitchen & BBQ on Bùi Viên. I ordered their Seafood Fried Noodles and they were very greasy with only 6 pieces of calamari and no other seafood. There are enough good places at similar or lower prices that this place gets a D+ only because I didn't get stomach cramps. A few posts ago I wrote about the tones determining the words' sound and therefore meaning. What just now occurred to me is that it happens in English, too. For example: read (reed) and read (red). At least Vietnamese warns you with those little marks above and/or below some letters: à, ả, ã, á, ạ, ă, ằ, ẵ, ắ, ặ, ẳ, ấ, â, ầ, ẩ, ẫ, ấ, and ậ. For example: Tôi ăn tỏi (I ate garlic). "Khách sạn" is pronounced "hek sa" and means hotel. My head's spinning, how 'bout yours? Some of the many menu items I've seen here include "well-stirred egg"; "flaked fried snake head fish"; "deep fried pig stomach"; and "blanched pig heart with onion" and many choices of how you can have your snake. Did not try any of the above, so I have no favorite... though I'm guessing it would be the first which is probably simple scrambled eggs. I was recently told by someone who should know that the young women who give massages work for tips only. That means that if someone is very generous and tips 50%, she makes US$5 for the hard physical work that is a $10 massage. 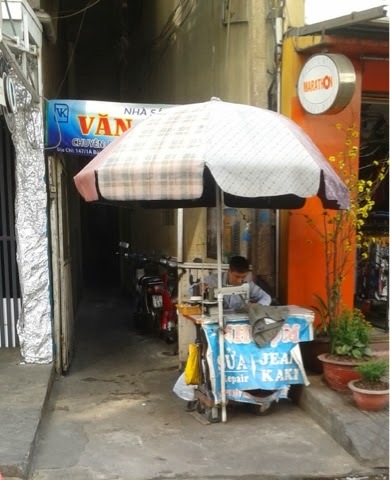 Since there are often more than 10 massage shops in a single block of the touristy areas, none of them are overflowing with customers and there are often six or more waiting masseuses. These are, again, mostly uneducated women from poor rural (redundant) families with few options and a societal need to send money home. I can understand why many resort to selling their bodies. I now tip 100% or more for every massage. The most recent got a $10 tip for an $8 massage. Another first... tomato juice from fresh tomatoes! I was not surprised by banana juice that tasted just like liquified bananas or watermelon juice that tasted like watermelon sans seeds and crunch. I was, therefore surprised to be surprised by tomato juice that tasted just like tomatoes with neither sugar nor salt added AND that was thin--like someone had just put a few ripe tomatoes in a juicer. Bếp Viêt Vietnamese Kitchen, 113A Bùi Viên. The food is good, too. The train was the least expensive, smoothest, and most comfortable of the four. One evening last week I started having extreme discomfort on my left side. As usual, I figured it would go away on its own. My morning, it was unbearable and I decided that I had to see a doctor. While still in bed, I called Travel Guard, the company from whom I'd purchased a medical policy for the length of my trip... or so I thought. Although after extensive searching shevcould find no record of my purchase, the woman with whom I spoke offered to help in any way she could, including finding a local doctor or hospital for me. I thanked her and told her I wanted to try one other option before asking her to work for free--which she was happy to do. My next call was Global Rescue, whom I did pay in case I need medical evacuation from anywhere to the U.S. hospital of my choice. Matthew James picked up my call and was incredibly helpful! He listed to my symptoms which, as I detailed them, sound a lot like how I've heard appendicitis presents with the possible exception that it was on my left instead of my right. After we talked for a while, he asked if he could do a bit of research and call me back in 20 minutes. Less than 10 minutes passed before Matthew called me with an appointment at a clinic less than 20 minutes from my hotel. That's service! The staff and doctor at the Family Medical Practice Vietnam speak English and were very solicitous. 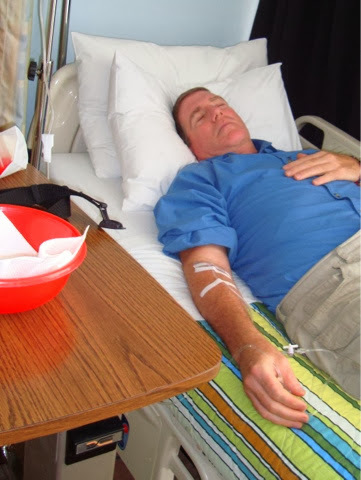 They found a bed for me to rest more comfortably and started a saline IV. After examining me further, the doctor ordered an ultrasound. This allowed him to rule out appendicitis and present me with the opposite diagnose many of us have had abroad... I was seriously stopped up and that was causing my heavy cramps. Now that I've had both extremes, I think I "prefer" this one. Now that it's passed (pun unintentional), I certainly prefer it over appendicitis! Thank you Michael James and Global Rescue!!! The green you see on most surfaces is glued-on artificial leaves, giving it a jungle look. Quite impressive, actually. I love the creativity! Back to Allez Boo (NOT going back, that is), the food is mediocre, the drinks crappy and over-priced with the added insult of a 5% service fee. I can only hope that since most people don't tip in Vièt Nâm, that the service charge goes to the help. If you want a big, loud tourist bar, go one block away from the park to the corner of Pham Ngõ Lão and Bùi Viên Streets where there are two from which you can choose. The Crazy Buffalo is classier (?) but GO2 has better music. Did I mention yet that just about everything here is LOUD?